Officer Cadet Todd Ledwith writes from the Royal Military Academy Sandhurst about Exercise BROADSWORD. The consensus is that Exercise BROADSWORD is by far the best exercise we have done thus far at Sandhurst. It is split into three phases – Urban, Rural and CIVPOP, through which each of the three companies in the intake rotate. For Alamein company, our exercise began in uncharacteristically relaxed fashion, as we were the first to play the civilian inhabitants of Longmoor village. The presence of CIVPOP gives huge training value to those in the Urban phase who play the part of the ISAF troops seeking to secure the area against the insurgent forces and enable free and fair elections. Between conducting serials ranging from demanding food and medical supplies from the Civil-Military Co-operation Centre to conducting a ‘shoot and scoot’ on a cordon, Alamein made the most of our time as civilians by hosting an ‘Alamein’s Got Talent’ evening and a home-grown rock concert from the back of a decked-out Troop Carrying Vehicle (the set finished fittingly with a rendition of ‘I Predict a Riot’). As this phase progressed, the attitude of the population became increasingly hostile towards the ISAF presence, culminating in a public order incident on the final morning. With well-organised ISAF forces armed with personal protective equipment, shields and batons facing off against an unruly mob in plain clothes and a few aggressive chants, the outcome was inevitable. Everyone moved into the Rural phase with some very impressive bruises. The Rural training area was of a larger scale that that of the Urban, allowing for our patrolling skills to be developed as we moved between the remote villages inhabited by civilian and insurgent forces alike (both played by the Gurkha Company Sittang and soldiers from the Royal Logistic Corps). As in the Urban phase, the training focus was upon dealing with improvised explosive devices (IEDs) as well as strike operations to seize IED making equipment or insurgent leaders and public order control. This phase also gave us experience of living in a company-sized forward operating base (FOB) with a view to future operations post-commissioning. Our final rotation found Alamein Company, in our mixed multiples of male and females (approximately half a platoon strength each organised into teams with a flexible order of battle), back in Longmoor village to become the ISAF forces we had railed against only days previously. The continuing complexity of non-conventional operations in this phase was one of the reasons the exercise was so enjoyed, giving commanders on the ground many new considerations to their decision-making process. Included in these considerations was the attachment of Ammunition Technical Officers (ATO) to deal with IEDs, military working dogs for search and protection and interpreters to communicate with the local population. At Company level, an Intelligence Cell was attached to the permanent Operations Room adding another level of application of knowledge to the scenario. Our control of the final riot went well and everyone maintained their composure whilst using appropriate force to control the situation. At the conclusion of the riot Exercise BROADSWORD was over in typically rapid fashion. We returned to Sandhurst with a few bruises and split lips but more notably we returned mentally drained. The sleep of a leave weekend was eagerly welcomed. Officer Cadet Todd Ledwith writes from the Royal Military Academy, Sandhurst, with details of his latest experiences of British Army officer training. This week was characterised by 2 particularly gruelling physical training (PT) sessions, one involving several circuits carrying 4 logs between the platoon for 4 repetitions around a course and the next, 2 days later (with damaged hands taped-up) running stretchers in hill repetitions interspersed with sections of the assault course and traversing obstacles in the Wish Stream. The sessions can be best described as ’emotional’. As well as being put through our paces physically, we have also begun to turn our minds to the estimate and orders process in a Counter-Insurgency, or COIN, environment in the run-up to Exercise BROADSWORD on which we deploy in a week’s time. The concern now is not simply a conventional enemy, but one which actively seeks to blend with the local population. Rather than meet force-to-force, this enemy attacks via improvised explosive devices, ambush and by influencing or threatening the mass of the population away from the support of the Security Forces, played by ourselves for two thirds of the exercise. For the remaining third, each company takes its turn at playing the local civilian population, or CIVPOP, and also the concealed insurgent force, interacting with the security forces under the guidance of several ‘serials’ which dictate their actions. The week did provide some room for leisure, and on Saturday night those cadets who had boxed were invited to attend the DeGale vs Groves fight at the O2 Arena. This was courtesy of Frank Warren, who had attended last term’s Academy Boxing Night. The fights were excellent with the main event being particularly exciting; a close fought bout which will hopefully result in an equally exciting rematch. Next week we continue our study of COIN as well as enjoying our first Loaded March of the term; a 9 mile route with 25kgs of kit. If you come down to the Academy today beware of a Senior Cadet with a rank slide and swagger in her step. Finally, Senior Term has begun and the distant prospect of Commissioning has turned smudge on the horizon to solid land mass; passing out ahoy. The first week has been very good fun: seeing the gang (as I like to affectionately term 2 Platoon, Alamein Company) and jumping straight into the Law of Armed Conflict and Counter Insurgency campaigns. We deployed on a short, 24-hour exercise, Senior Stretch, to ensure that the “recess demons” were banished. The exercise comprised advance to contacts and night navigation. In the little personal administration time we were given before the night navigation, 2 Platoon stretched out on our bergens and dozed a little in the sunshine (finally, no more cold injuries). The Company Commander, Major Lytle AAC, surprised the few left awake. One or two of the cadets hastily pulled down their t-shirts and coloured a shade of crimson. There was another check to ensure no one had slacked off on fitness over the Easter break with Physical Fitness Assessment 4; sit-ups, press-ups and a mile and a half best effort. I was one of the chosen few called into Captain Webb’s office for a dressing down because my fitness had been found wanting. The mood of the cadets in Senior Term is different. A little sunshine but the training is exacting a price just as it has imbued us with skills and the knowledge of our own capability. If I were to choose one moment, one episode from last term, which took the civilian from me and replaced it with soldier that episode would be bayonet training. It is hard to believe that one hour can insert a splinter of steel into your very soul. The cult of initiation into the British Army betrays its pinnacle in bayonet training. Forty or so Officer Cadets were marshalled into lines approaching straw sandbags by the duty Colour Sergeant whose sidekick, “the motivator” was waiting in the wings to exact physical degradation until you were bereft of sentient thought. I stood, stamping my feet, chanting “kill, kill, kill” in the beginning with reticence; civilisation preventing engagement with this bloodthirsty ritual. It took less than half an hour of leopard crawling through ditches or pulling myself along the ground in press-up position before I was too worn out to think at all. We were given motivating speeches, and to act as we would do if an insurgent was trying to kill one of the soldiers under our command, an eighteen-year-old at that. I stomped the ground chanting “kill, kill, kill” approached the sandbag, screamed “en garde” and stabbed it in the heart with full force. I checked my bayonet and put my rifle in the high port. The Company Commander told me afterwards he was never going to let me near a bayonet again. Of all the things to be good at bayonet training is not what I would have chosen but should the slimmest chance prevail (for some) and a situation call upon our training, we now know that we are steely-eyed dealers in death. The price exacted by two terms at Sandhurst is the soft side; a glimmer is visible of why values and standards are so important to the British Army. You train hard to fight easy but fighting does not come naturally to most; it is altogether “other”, the aggression that must be controlled, yet at your fingertips as just another resource among many to be called upon in the loneliness of command. In Junior Term we did not know what was going on half the time and were trained not to think. In Intermediate Term we were asked to remember how to think and now in Senior Term, to understand the complexity of current operations and the decisions that will shortly be ours to make, thinking is imperative. Just as it should be, the magnitude of responsibility that a Platoon Commander, an officer in the British Army, undertakes looms daunting. Officer Cadet Todd Ledwith writes about the start of a new term at the Royal Military Academy Sandhurst. A new term begins at Sandhurst and our newly-issued rank slides denote that we our now Seniors – hopefully only a matter of 14 weeks away from gaining our commissions. Similarly to last term, this one began with a short, sharp exercise known as Exercise SENIOR STRETCH, designed to blow out the inevitable cobwebs which form after three weeks of living in the outside world. Deploying on Monday night after a day of lectures on the media’s impact on current operations and a start of term address by the College Commander, we established our hasty harbour and immediately launched into a series of reconnaissance (recce) patrols to locate any Combat Security Outposts (CSOs) held by our enemy, the Northern Democratic Front or NDF. One such location was identified and permitted a dawn attack to be launched by the platoon. Tuesday then saw the platoon conduct a series of advance to contacts, patrolling on a bearing in order to find and destroy the enemy. Back in the harbour, this was followed by an orders group for an ambush to deny the enemy the chance to resupply. This ambush was subsequently cancelled and replaced by the challenge of completing a solo night navigation exercise on the area whilst remaining tactical in our use of light and tracks routes. A strong performance by the platoon in Friday’s Personal Fitness Assessment will hopefully serve to maintain or improve our 3rd place in the Sovereign’s Banner Competition as we enter the concluding events. The rest of the week has been lecture-heavy and concerned with the complex situational briefing for the upcoming Exercise BROADSWORD which takes place in week 4 and the Counter-insurgency (COIN) and Stabilisation doctrine which will take precedence in our future exercises and careers. The final three events of this term’s Sovereign’s Banner competition were fought out with a log race around the camp, in the classroom for the second Military Written Test and on Old College drill square for the Drill Competition. It has been a drill-laden week as we prepare for the Sovereign’s Parade at the end of term next Friday. The Parade marks the completion of the Commissioning Course for the Senior term and the Intermediate term also take part, this requires a great deal of practice in order to properly synchronise the approximately 500 people who will be on the square. At the conclusion of the practice on Saturday morning, we were treated to the Senior term’s skits on the parade square; a chance to make light of the events and personalities from their year here, ostensibly free from repercussions. Other notable events this week were that we threw our first live grenades on the ranges and attended the last Church parade of the term where the Sandhurst Colours were laid at the altar to signify placing the life of the Academy at the altar of God. With one week left, the schedule becomes even more drill-orientated to ensure that the parade is of the highest calibre, in keeping with the tradition of distinction that Sandhurst enjoys in this area. Adventurous training and leave are only 5 days of hard work away and for the Senior term, the end of the week will see them realise the ultimate goal of the course – a commission. 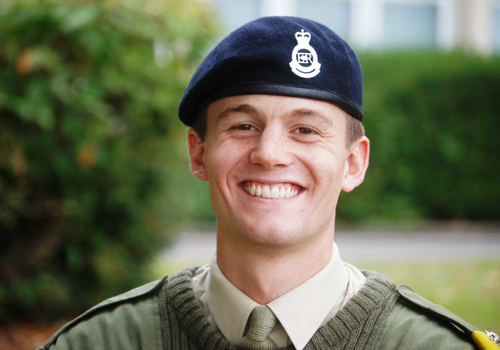 Officer Cadet Todd Ledwith blogs from the Royal Military Academy Sandhurst. He’s had his Regimental Selection Board interview with the Army Air Corps. How did he do? As is the norm at Sandhurst, the events which you worry about the most are those that come around quickest. After weeks of concern, I suddenly found myself being led into a room in Old College and sat down to begin my Regimental Selection Board interview with the Army Air Corps. The interview, likewise, flew past in a blur. It would appear I did enough to convey my desire and suitability to join because after an afternoon of drill practice I found myself back in said room receiving the news that I was to be offered a commission. I was ecstatic, a fact which was no doubt conveyed to the documentary camera crew by the stupid grin on my face. The boxing event that evening gave cause to continue the celebrations as both boxers from Alamein Company won their bouts and the ‘Best Boxer’ trophy was awarded to a member of my platoon. As was the case last term, it was a great event characterised by exciting bouts, impressive pomp and circumstance (thanks to The Band of The Blues and Royals) and slick execution. Everyone enjoyed themselves, despite the looming fact that we had a full room and locker inspection the next day which required much ironing and cleaning to be done upon our late return. For some, interviews or results from those interviews were also impending; hopefully the event proved a welcome distraction. Bayonet training on Thursday provided us with the skills to utilise this close-quarter weapon if a situation should deem it necessary in battle. Whilst gruelling, afterwards it emerged that stabbing sandbags was a brilliant form of stress relief after the jittery build-up to RSBs. Friday’s Advanced Combat Fitness Test (ACFT) was another arduous event whose subsequent endorphin release upon completion of the 1.5 mile loaded run had much the same effect as the previous day’s event. After a week of milestones passed, we look forward to the log race on Monday and the Drill Competition on Thursday of next week, both of which are Sovereign’s Banner events and give us a chance to pit ourselves against the other 8 platoons in the intake. In her latest update from the Royal Military Academy Sandhurst, Officer Cadet Elizabeth Eldridge looks back at an 8-day exercise in the Brecon Beacons and a working visit to the beaches of Normandy. Officer Cadet Wentworth, 2 Platoon, gloried in the wind across her face as she sprinted through the woodland about the lake. In the undergrowth she spotted a deer, stopped mid-run and took an aimed shot. Miss Wentworth then continued on her chosen route enjoying the spring weather change. Unfortunately, there are no deer in the Sandhurst grounds, Miss Wentworth did not actually have a rifle and Captain Power PWRR, 1 Platoon Commander, was driving past on his way home. After witnessing this very private moment Captain Power related what he had seen to the Colour Sergeants – with what are now known to be embellishments: the throwing of an imaginary grenade and diving for cover in the undergrowth. At muster parade, the story of Miss Wentworth’s heroics was related to the assembled Alamein Company. 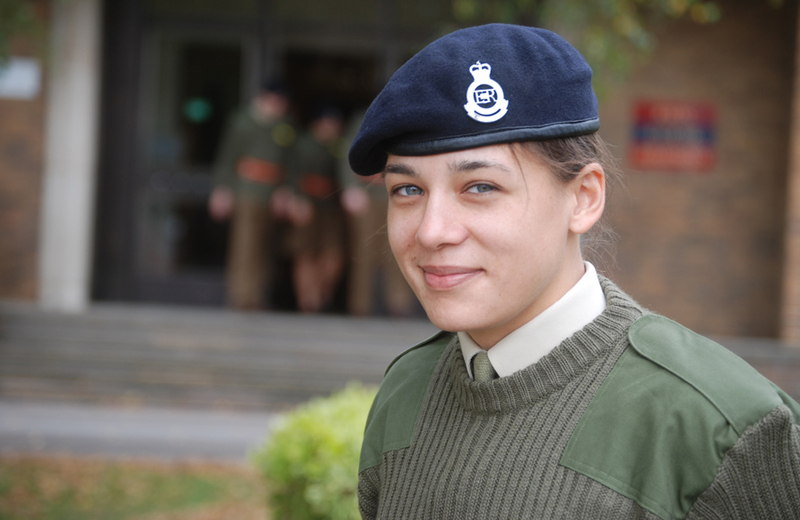 Miss Wentworth is a top third cadet, chosen to represent the Academy at the upcoming games in the US at Westpoint, who is more often than not quite sensible. Exercise DRUID’S RIDGE spanned 8 days, back in the now-familiar Brecon Beacons. All 3 companies of our intake, battalion level, occupied CileniVillage. The village comprises 20-or-so mock dwellings (no electricity or plumbing) modelled on German architecture which are used for Fighting in Built Up Areas training. The scenario ran that 2 Sandhurst Rifles (the exercise cadet force) were expecting an imminent attack from the Malyban (the exercise enemy force played by the Gurkhas) and had to defend the village. Barbed wire defences and minefields were constructed whilst the houses were boarded up to minimise likely entry points. In House 19 were 1 Section and 2 Section of 2 Platoon. Our stag position was reached by descent into the gloomy concrete basement which was slightly flooded, through two holes in walls, through a tiny floor level gap (webbing, patrol sack and weapon had to be removed) and finally up some stairs to the sand bagged vantage point. I lost my head torch on a recce patrol the first night and had to negotiate the obstacles in the pitch black with my heart beating a theme from Silence of the Lambs. The shout was joined by many more voices whooping “End Ex”. 2 Platoon had their photographs taken on a tank, cleared up the defences and headed back to the Academy. Last week we went to Normandy to study the Normandy landings and parachute operations. The academics who teach War Studies in Faraday Hall joined us and stern warnings were issued that the trip was not a battlefield tour. Indeed it was not. At each site we were given the scenario the officer faced and asked to use the 7-question combat estimate “What are the enemy doing and why?” to analyse what we would do. It was mentally taxing as whilst for some situations we were given an hour or 45 minutes these were interspersed with 5-minute considerations. It was heartening to know that using the tools provided resulted in cadets, in the most part, finding the right answer or perhaps the only answer. Captain Power took a composite platoon of mixed syndicates, men and women, for the exercise and elicited a poignant moment on our final day. We stood in a huddle on Gold Beach looking out to where, 60 years before, the landing crafts had approached, 300m from the bunker the allied forces had to neutralise. A minute or less later 30 breathless cadets stood in limited cover under the rocks fronting the WWII bunker. “Come up with a plan and capture the bunker,” said Captain Power picking on a cadet to play the only officer left standing. There were 9 machine gun positions protecting the beach front and the gunnery position. The slight loss of breath, the knowledge that the officers before us had run twice the distance under fire as soldiers fell in the approach, that the officers had been little older than many of the cadets and had kept courage under pressure in order to capture the concrete bunker lent clarity to the final day of learning from the actions of our predecessors. In the afternoon we visited a memorial to those who had lost their lives in the Battle of Normandy; Padre Stephen Dunwoody led us in a short service of remembrance. I can only think of the sacrifices of those before as a civilian not as a soldier. My eyes are irrevocably drawn to the faces of the directing staff who think of those they have lost in recent conflicts; of friends.